Searching and fixing your BIG data was never easier ! START YOUR FREE 21-DAY TRIAL TODAY! How is The DataSurgeon better? Find the info you need using easy placeholders describing its general 'form'. 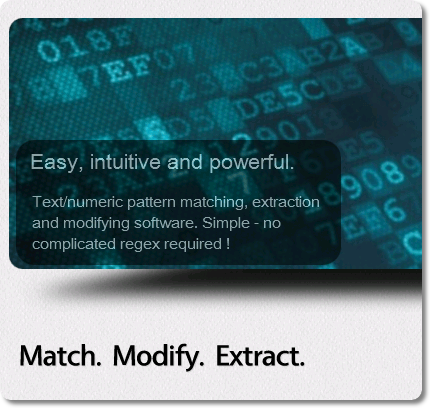 A search/replace, data query, AND data management system - all in one. Free-form data manipulation - add, omit, and rearrange anything anywhere. NO baffling regex / grep commands to learn... TOO COMPLICATED! Industrial-Strength - rip through unlimited files/data at lightning speed. Search/modify through your whole data record OR just in a specific field. Multi-OS filetypes - read and output Windows/UNIX/Mac format text files. Refreshingly clean, uncluttered interface - straightforward and simple.